President Rivlin meets Ethiopian PM Dessalegn, speaks about future of Israel-Africa relationship and cooperation on science, technology. 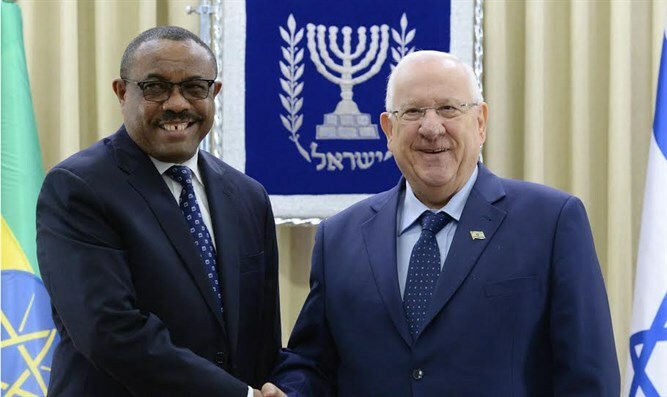 Israeli President Reuven Rivlin on Monday morning met Ethiopian Prime Minister Hailemariam Dessalegn at the President's Residence in Jerusalem. “We are very anxious to get back to the connection that we have had with Africa, and we ask you to be our sponsors in Africa in order to let us be once again able to attend all the meetings and conferences of Africa, because when we are looking to the future, and to the next decade, we know that Africa is the place. “We have a great community of people who came from Ethiopia living here in Israel; among them are generals, doctors, pilots, ambassadors, part of the Israeli environment and experience. Dessalegn thanked Rivlin for the warm welcome he and his delegation had received at the President’s Residence and in Israel. “The African Israel relationship truly is a gateway, we will do everything at our disposal to make the Israeli Africa relationship to grow and Ethiopia will take leadership in this regard. We know the need for the Africa Israeli relationship to deepen. Dessalegn also thanke Rivlin for Israel’s support of the election of Ethiopia’s former Foreign Minister, Dr Tedros Adhanom Ghebreyesus, as the new Director General of the WHO. “He is a great personality, and we are very proud to support his election. The whole world must be proud that he was elected chair of the organization,” Rivlin responded.